There’s an eccentric touch in the end credits for Guy Ritchie’s Sherlock Holmes. They’re beautifully done, freeze-framing all the preceding mayhem into elegant graphic stills to recall Sidney Paget’s original magazine illustrations. Then up pops the page for the movie’s literary source – credited to “the late Sir Arthur Conan Doyle”. How late can you get? Watching this pumped-up Victorian buddy movie, Doyle might have wondered what mad century he’d stepped into. 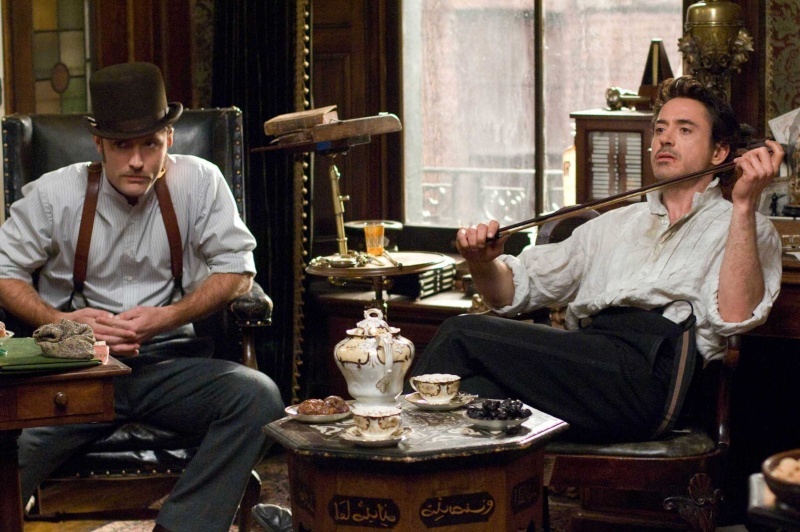 You’ll look in vain for a deerstalker on the head of Robert Downey Jr’s Holmes. In the first scene he’s busy cracking ribs. This Sherlock, we quickly discover, is a bare-knuckle boxer and man of action, whose phenomenal skills of amateur sleuthing are a virtual sideshow. Downey spends half the film stripped to the waist, diving away from explosions and repelling a 7ft French goon by bouncing hammers off his chest. You can add a big dose of Captain Jack Sparrow raffishness: at one point Downey is tied naked to a pair of bedposts, which is not a pose we’d have often wanted from Peter Cushing. The challenge here is finding any time for detection at all, in a movie so brusquely determined to power its way from one crash-bang-wallop set piece to the next. Three minor characters are killed off somewhere in the middle, less for any crucial plot purpose than to provide Holmes with some locked-room riddles to solve: Downey turns up, fondles a few clues, and then waits to the very end to tell us what they all mean. In each case, the puzzles are less ingenious than Sarah Greenwood’s production design, which is just fantastic – a definite high point in the recent vogue for comic-book Victoriana. As usual, Ritchie overdoes the flash; there’s hardly a scene he doesn’t want to edit back to front, and the opening sequence of Blackwood’s capture, which he intends to feel like the overblown finale of a previous case, doesn’t work at all. Still, it’s fun flash, on the whole: powered by Hans Zimmer’s antic score, the movie has a restless, try-it-on quality that keeps you on your toes. Rachel McAdams, as American femme fatale Irene Adler, feels like very pretty window-dressing, because the script never decides what to do with her beyond setting up the shadowy, sequel-hinting presence of an accomplice called Moriarty. Too often she and Law are competing for scenes. We want more Law! But that’s a fairly sure sign this droll blockbuster has got you on its side.